For the record, I found them before they found me. It was last spring that I stumbled onto the candy-eating pumpkin on KidsHealth.org, a calorie-counting game. Even though I knew it was most appropriate for Halloween, it was too fun to save, so I blogged about it right away. I was impressed that the website was funded by a nonprofit dedicated to children's heath, instead of corporate sponsors, and that their activities were both entertaining and educational. 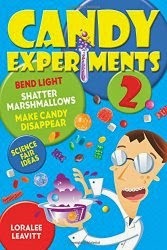 Now KidsHealth.org has found candy experiments. Since candy experiments fit so well into the KidsHealth.org mission and methods, KidsHealth.org will soon be publishing ten candy experiments on their website. I'll be excited to see how they turn out. Especially if they put the experiments near the candy-eating pumpkin.